HBO has been a staple of cable TV for decades and the company is determined not to be left behind in the modern 'on-the-go' age of streaming entertainment. For people with cable TV subscriptions that include the premium channel, HBO Go is available at no additional cost. HBO Go is a mobile adaptation that provides viewers with access to HBO programming via gaming devices, tablets and phones. However, not all providers support all devices, so double check which devices are supported by your cable TV provider. Activate your device. At this point you will be given an activation code. The code is inputted online and then on your device. Specific instructions for different kinds of devices are detailed below. Sources include the HBO Go website, PC Mag, Solve Your Tech and gaming sites Xbox and PlayStation. Download HBO Go and Open it - this will force open a login page. Sign into your HBO Go account. Select your TV provider and enter login/password information. Download HBO Go from Google Play. Open app - this will force open a login page. Download the HBO GO app from Amazon Fire TV store. Open HBO GO on the device. In the main menu, highlight 'Welcome' and press right on the navigation ring of the Amazon Fire TV remote. On the Welcome screen, ensure that Activate HBO GO is highlighted and press the select button on the remote. This will create activation code. Remain on this page while you have entered the code on your computer. On your computer, navigate to www.hbogo.com/activate. On the Activate a Device page, enter the activation code and click Activate Device. A Success message should be visible on your television and browser. Download HBO GO from the app store. Launch the app on your PS3. On the Welcome screen, select Activate HBO GO to will generate the activation code. Stay on this page. On a computer, go to www.hbogo.com/activate and select PlayStation 3. Select your TV Provider - and enter password/login associated with the account. Note: If your TV Provider is not listed, access to HBO GO on PlayStation3 is not offered as part of your HBO subscription. On the Activate a Device screen, enter the code displayed on your television. A Success message should appear on the TV screen and in your browser. Download HBO GO from app store or marketplace. Launch HBO GO on the PS4. Select Activate HBO GO panel on the Welcome screen. This will create the activation code on the next screen. On the Activate a Device screen, enter the code displayed on your TV and click Activate. A Success message will appear on both your television and your browser. You must have an Xbox live membership. Go to the Xbox dashboard and download HBO GO. Launch it on the Xbox. Select Activate Your Device to generate the activation code. Stay on this page. On your computer, go to www.hbogo.com/activate. On the computer, select Xbox 360. Select your TV provider and enter the username and password associated with your TV Provider account to login. On the Activate a Device screen, enter the code that was displayed on your television. The Success panel will appear. Download HBO Go from the Xbox dashboard. Click Activate Your Device which will generate a code. Go to www.hbogo.com/activate. On the Active Device screen, enter the code generated in step 4. Find the HBO Go in the Channel Store and download. Launch HBO Go on the Roku. Click Activate Your Device to which will generate a code. Enter this code on your computer at www.hbogo.com/activate. Select your TV provider and enter password/login associated with the account. On the Activate Device screen (on TV) enter the same code you entered on your computer. Within two minutes or less a 'Success' screen should appear. On your Apple TV, launch HBO Go. Select Activate Device. This should give you a code, which you will enter on your computer by going to www.hbogo.com/activate. Select your TV Provider - and enter password/login associated with the account. Within two minutes or less a Success screen should appear. Go to Smart Hub and download HBO Go. Click Activate Your Device. On the next screen an activation code will appear. On a computer, navigate to www.hbogo.com/activate. Select your TV provider and login using the username and password associated with your TV provider. On your TV monitor, the Activate a Device screen should still be visible. Enter the activation code. A Success message should appear in both your browser and on the TV. Since Chromecast is a unique type of streaming in that it 'casts' the content from your phone, tablet or laptop to the TV, setting it up is slightly different than other streaming devices. There are two ways to cast the content and both require plugging the Chrome cast device (called a dongle) into the HDMI port of your TV, a fast computer and a Wi-Fi connection. Install the Google Cast extension. Click the 'casting' icon in Chrome. Content inside your browser will display on your TV. Go to Google Play or iTunes and download the HBO Go app. Launch the HBO Go app. Navigate to Movie or TV show. The selected program will display on your TV. 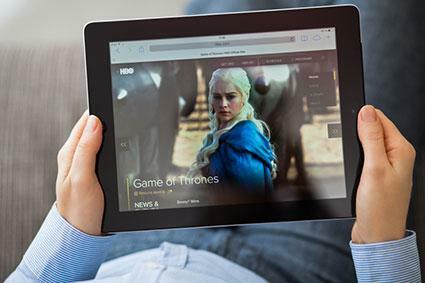 Some of the most common problems people have with the HBO Go service include login issues or an inability to view content. If, after the password and login have been verified, a user still cannot log in, it is an issue with their TV provider and the provider will need to be contacted. If a user can log in, but the content is not available, that is an HBO Go issue and HBO Go should be contacted. Another common problem is too many users or devices attempting to access the same account. Double check with your provider to determine the number of permitted users or devices. After teasing HBO subscribers of a possible standalone product, HBO delivered in 2015 with HBO Now. The content is HBO's complete lineup plus 'Hollywood blockbusters.' Unlike HBO Go, users do not need a cable subscription to use HBO Now. To purchase the product, users can visit the Apple store and download the app. An android app is in the works, but is not available as of July 2015. Until it's ready, non-Apple users can watch HBO Now on a PC or on their TV by using Chromecast.